About 90% of all neoplasm of the pancreas are ductal adenocarcinomas. It is a common neoplastic disease with a poor prognosis. 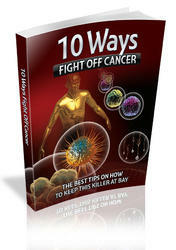 It is estimated that approximately 32,000 Americans will die of this disease in 2005 . Pancreas carcinoma is the fourth leading cause of death in the USA and its five-year survival rate remains dismal, at less than 5%. This poor outcome is largely related to the aggressiveness of the tumor and in most cases, to late diagnosis. The initial diagnosis of pancreatic tumor, particularly if the patient presents with jaundice and the tumor is located in the head, may be made by ultrasound. Ultrasonographic signs of pancreatic carcinoma include focal or diffuse pancreatic mass, which is hypoechoic relative to normal gland parenchyma, and dilatation of the pancreatic and/or biliary ducts. The accuracy of ultrasound for detecting the level of bile duct obstruction varies greatly, and its staging of pancreatic carcinoma is inferior to that of CT. Ultrasonography often fails to provide an adequate examination of the entire gland, resulting in an overall decrease in sensitivity. Some of these limitations are overcome by endosonography, but even for EUS, tumors in the tail of the pancreas are not always accessible. phase thin-slice MDCT technique was recommended for best results in assessing resectability of pancreatic adenocarcinoma . 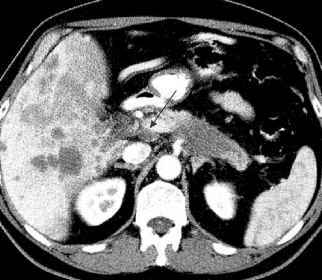 On CT, pancreatic adenocarcinoma arises from the pancreatic duct and usually appears as a low-density mass often associated with poorly defined margins and pancreatic and/or bile duct dilatation (Fig. 1). The low-density central zone represents the hypovascular, scir-rhous tumor surrounded by normal parenchyma or inflammatory tissue caused by obstructive pancreatitis. Cystic degeneration is occasionally seen . Frequently, pancreatic duct obstruction causes atrophy of the pancreatic parenchyma and only a thin rim of parenchyma may be seen accompanying a dilated duct. Tumor obstruction of the main pancreatic duct can lead to rupture of side branches, resulting in formation of pseudocysts. Occasionally, no low-density mass is identified, but a dilated duct is seen proximal to a small imperceptible tumor mass. Ancillary findings are local tumor extension including direct invasion of neighboring organs and vessels (loss of fat planes surrounding the celiac axis, SMA, etc., so-called vascular 'cuffing') and metastatic disease to local lymph nodes, as well as spread to liver, peritoneum (often associated with ascites) and more distant sites. The so-called 'double-duct sign' (dilatation of the biliary and pancreatic ducts) occurs in less than 5% of patients with pancreatic carcinoma. Biductal obstruction also may be seen in bile duct or ampullary carcinoma, pancreatitis and ampullary stenosis. If MRI is used, Tl-weighted fat-suppressed sequences and dynamic gadolinium-enhanced spoiled gradient echo (SPGR) sequences appear to be superior to T2-weighted sequences due to the fact that most pancreatic carcinomas have a significant desmoplastic reaction that renders the tumor less conspicuous on T2-weighted images. Tl-weighted fat-suppressed images using an early (arterial) gadolinium-enhanced SPGR sequence provide the best delineation of the tumor, particularly if it is small. Fig. 1. a Thin-section MDCT of pancreas carcinoma, pancreatic phase. A low-attenuation mass is apparent in the distal body of pancreas with slight indentation of the splenic artery (arrow). This appearance does not necessarily constitute adherence or invasion, and a graft or stent can be placed due to the short segment involved. The mass is easily distinguished from adjacent normal pancreas (arrowhead). b Thin-section MDCT of pancreas carcinoma, pancreatic phase, 1 cm below 1a. Note the oval-shaped mass of low attenuation (arrows) and the dilated pancreatic duct (arrowheads) abruptly ending at the mass. c Thin-section MDCT of pancreas carcinoma, hepatic phase, same level as 1b. While the mass (arrows) is still evident, it is less conspicuous in the hepatic phase resectability. Only one MR study using gadolinium and MR angiography revealed superiority over CT. The advantage of MRI is thought to be in the area of small tumors, which do not alter the contour of the gland . At present, CT is the modality of choice in the work-up of suspected pancreatic disease and MRI appears to be a problem solving modality. MRI may be helpful in cases where clinical suspicion of disease is very high but results with MDCT are negative or equivocal. In addition, when choosing an imaging modality, one has to take into account the fact that with MDCT, imaging of the pancreas, including preparation, takes a small fraction of the time needed for a complete MRI of the pancreas. 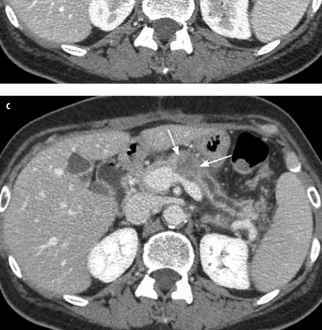 Overall, MR of the pancreas should be considered in patients (1) with elevated serum creatinine, allergy to iodine contrast, or other contraindications for iodine contrast administration; (2) with prior CT imaging who have focal enlargement of the pancreas with no definable mass; (3) whose clinical history suggests malignancy and in whom CT imaging is equivocal or difficult to interpret; and (4) whose case requires distinction between chronic pancreatitis with focal enlargement and pancreatic cancer . False positive diagnoses of pancreatic cancer occur, especially in patients with chronic pancreatitis, and, therefore, percutaneous aspiration biopsies are needed if nonoperative treatment is planned. 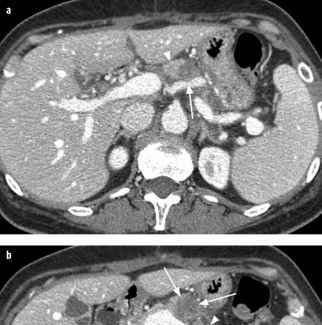 Fine-needle aspiration biopsy of pancreatic cancer under CT-guidance is a frequently performed procedure and is associated with severe pancreatitis in less than 3% of cases. Pancreatitis is more likely to occur if normal parenchyma is biopsied. Therefore, biopsies should be carefully planned by placing the needle into the mass itself and by avoiding puncture of the pancreatic duct. The sensitivity of percutaneous CT biopsies reaches 79%, with a positive predictive value of 100% and a negative predictive value of 47% . Because of possible tumor seeding in the needle tract, patients with potentially resectable tumors (only 10% of all cases) who are acceptable candidates for surgery should undergo exploratory surgery . Today, percutaneous CT biopsies of the pancreas are often replaced by endoscopic biopsies that have a sensitivity of 80% with a positive predictive value of 99% and a negative predictive value of 73%, particularly if CT is equivocal or negative with a strong clinical suspicion of tumor and when the lesion is less than 3 cm in size . While EUS excels at detecting even small pancreatic adenocarcinomas, reaching sensitivities as high as 97%  and can be used in the differential diagnosis of pancreatic tumors, it demonstrates poor sensitivity and specificity for diagnosing vascular involvement by tumor . EUS suffers from limited depth penetration and cannot always distinguish between an inflammatory and neo-plastic process in the pancreas. CT alone . In one PET study, if helical CT was positive for pancreas carcinoma, PET was found to have a sensitivity of 92% and a specificity of 68% and if CT was negative, the sensitivity of PET was 73% and the specificity 86% . PET/CT allows a more precise localization of hot tracer spots and has been shown to improve patient management before possible resection. In one PET/CT study, management was changed in 16% of patients with pancreatic cancer that were initially staged as being resectable . In suspected tumor recurrence, PET reliably detected local recurrence and was advantageous in diagnosing distant disease .